A pair of Harry Potter fans are celebrating getting engaged in an unusual - and very public - way. After pictures of a piece of beach art circulated on social media on Saturday, there was speculation about who Ben and Nia were - and whether she said "yes". 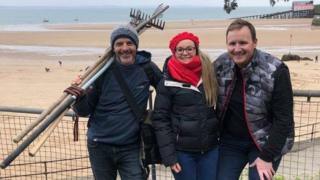 Ben Griffiths surprised his girlfriend Nia Roderick by commissioning Welsh sand artist Marc Traenor to draw his proposal on Tenby's north beach. It turns out Nia did say yes - although she had to look closely to spot it. That is because the proposal, which read "Nia, will you marry me?" in Welsh, was a small part of a much bigger Harry Potter-themed coat of arms. Image caption It took three hours for sand artist Marc Traenor to complete the piece on Tenby's north beach, which reads, in Welsh: "Nia, will you marry me?" "It was such a surprise because we're not romantic at all like that," said Nia, who is originally from Bridgend. "We had gone to a pub for a drink when suddenly Ben said he didn't feel very well, and that he needed to go out and get some fresh air," she explained. She said: "I got excited, because I love his work, and the picture contained some elements from the Harry Potter books. "I was standing there looking at the man doing his job and I told Ben, 'Look. There are two letters in the picture; B and N'; and suddenly Ben tapped me on my shoulder and asked me to turn round. "There he was, down on one knee, and that was when I realised he had organised all of this. And of course I said, 'yes'."